I love your magazine! There's always something in it that I want to stitch! The new Sampler Sleuth, artist biography, and designer Q&A sections make the magazine more interesting and enjoyable to sit down and read. I love this magazine the most. The articles in each mag are very interesting and I love all of the projects. I do always look forward to the magazine coming in the mailbox. Love the holiday editions. 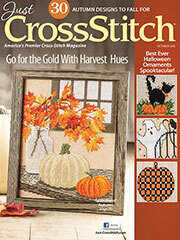 I always look forward and enjoy every issue of Just CrossStitch that I received. I have loved this magazine, always renew - and always will. Don't always have time to stitch but love to keep up with new techniques, flosses and other materials.